Lake Monster or floating log? My argument against Champy has been the lack of any carcass or skeleton. If plesiosaur fossils can be found then why not the legendary Lake Champlain critter? So I'm surfing the cable TV channels, looking for something good to watch (my remote's channel button is wearing out) when I stumble upon an episode of Ancient Aliens Declassified on the alleged "History" Channel. There's discussion of Champy and other such creatures from around the world. So how can they be so elusive, leaving not a trace behind? Simple. Underwater wormholes. The serpents are extraterrestrial, popping in from temporary interdimensional portals. Wouldn't such portals be detected on the surface by the water below being suddenly displaced, fountaining up? Wouldn't their presence be detected by sonar devices, i.e. fish finders and depth finders? Of course Ancient Aliens always includes such qualifiers such as "Could it be...?" and "According to ancient alien theorists..." with no definite conclusions. Could it be the "History" Channel has sold out to boost ratings? Yes. Could these interdimensional portals allow other beings to pass through such as the Easter Bunny and Lovecraftian terrors as ancient astronaut theorists proclaim? Well, why not? Maybe I'll spot Cthulhu exploding to the surface, towering above all. 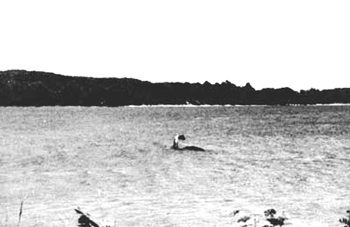 * Champlain saw a strange creature near the Saint Lawrence river, not Lake Champlain as been erroneously stated.